At first glance, Anomaly Flats is the picture perfect example of an old fashioned small town. Located somewhere off the main highway, the quaint town emerges from a winding road and reveals the buildings from a bygone era. With a vintage diner, theater, and bar, Anomaly Flats is as "if the American Dream were a town." Mallory Jenkins is driving to Canada with little more than a backpack that contains something worth running away with. She does her best to keep a low profile until a wrong turn and car trouble leave her stranded in Anomaly Flats. Determined to spend as little time off the road as possible, Mallory wanders into the Nite-Owl Diner and begins to discover the true nature of the city. Anomaly Flats is a richly drawn setting that contains much more than meets the eye. Every person and place that Mallory encounters has some kind of quirk. 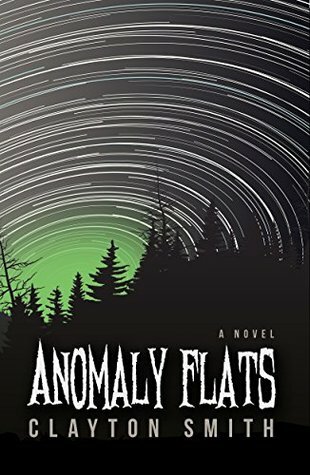 From the diner that only has one item on its menu and coffee that keeps the residents sterile to a Board of Tourism employee who discharges flies from her mouth, and even tentacle infested plumbing, Anomaly Flats is revealed to be a mysterious and sometimes dark place that defies any logical explanation. Even worse for Mallory is the fact that the town rarely attracts any outsiders and has rarely seen a citizen leave. As she waits for her car to be repaired by the only mechanic in the town, Mallory struggles to maintain her sanity and to find a way to escape Anomaly Flats. Author Clayton Smith delivers an immensely inventive and endlessly entertaining B-movie of a novel in Anomaly Flats. Best resembling something out of the old Twilight Zone T.V. series, this genre-defying novel combines darker sci-fi and mystery elements with Smith's wit and humor to delightful effect. The people and places who inhabit Anomaly Flats are so skillfully imagined that my only complaint with the novel is that I wish I could have spent more time exploring it. While I never felt that the story was rushed, the end of the novel left me wanting something more. That being said, Anomaly Flats is a refreshingly original novel that I devoured over a couple nights and one that I highly recommend. This entry was posted on Monday, November 30, 2015 and is filed under Anomaly Flats,Clayton Smith,Dapper Press,Fiction,Independent Publisher. You can follow any responses to this entry through the RSS 2.0. You can leave a response. This sounds like my kind of book and I like the idea of the slightly darker hint of sci-fi in it. I am glad you could like it! This is definitely one of those rare books where there's something for everyone to enjoy!